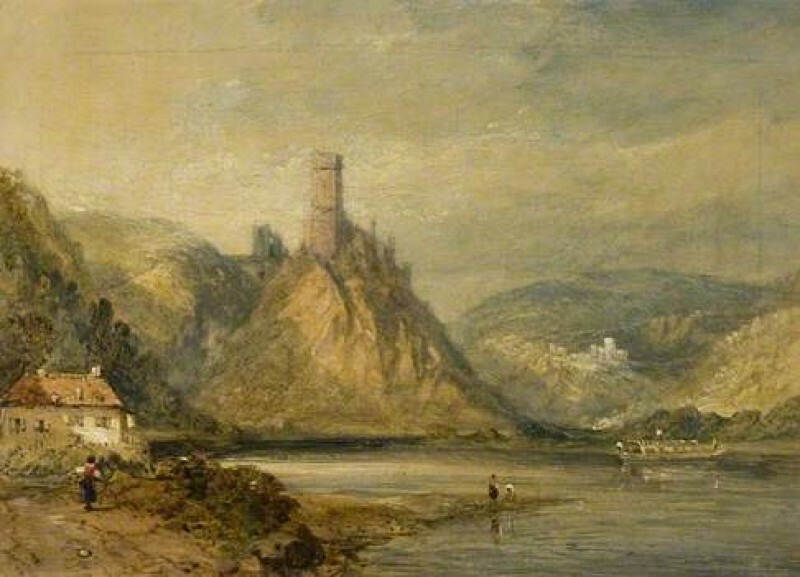 Martin Hopkinson proposed that Shipley Art Gallery’s Lake Scene with Castle, attributed to James Baker Pyne, depicted the Rhine – possibly between Koblenz and Rüdesheim am Rhein. The collection thought the castle could be Marksburg Castle, Braubach. A few suggestions were put forward, such as Castle Sooneck between Trechtingshausen and Niederheimbach, and it was put forward by Andrea Kollman, after comparing many views, that ‘shape of the ruin resembles paintings of Metternich castle in Beilstein at the Moselle, but the rock formation looks more like Schonburg castle in Oberwesel at the Rhine’. A painting description was added to the record. Does this 'Lake Scene with Castle' actually depict the Rhine?